Planning on attending a full round of #GRIDLIFE events this year? #GRIDIFEGOLD season passes let you lock it in once, get a bunch of exclusives and never have to worry about on sale dates again! With multiple events this year we have multiple options for season passes. Choose from 4 5 7 or 9 packs allowing you to build your own #GRIDLIFE Adventure in 2019. 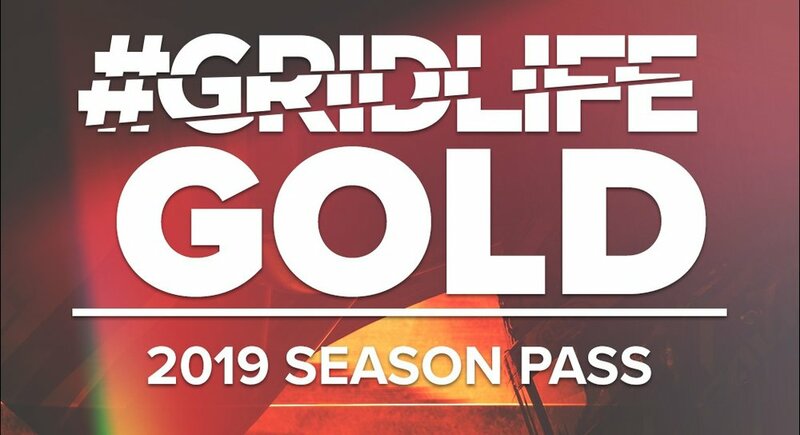 #GRIDLIFEGOLD season pass holders will get a lanyard hard card along with 2 guest passes per event good for entry for the entire season. In addition Both HPDE & Time Attack ticket holders will get access to some tremendous exclusive partner offers good throughout the 2019 season. All this coupled with an exclusive gold merch pack, spotters guide inclusion and so much more. BUY NOW PAY LATER! Our Payment plans break up the cost over 3 payments so you can lock it in spread it out over the build season and be ready to go come April. The full GRIDLIFE season. Every event. * Listed prices do not include taxes and fees. Individual events for Season pass holders are transferable up to one week prior to the event start time. This applies to Time Attack, HPDE Passes. GOLD PASS holders will be allowed one event refund. (Equal to the 1/4 1/5 1/7 or 1/9 of the total cost minus fees and additional tickets.) Refunds will be issued up to 45 Days prior to the event start time. After 45 Days individual event tickets can only be transferred not refunded. REFUND AND TRANSFER POLICY IS SUBJECT TO CHANGE.